A brand new development set off the main road away from traffic noise. If you are in or around Heathrow for Business or Travelling then this is the place for you. 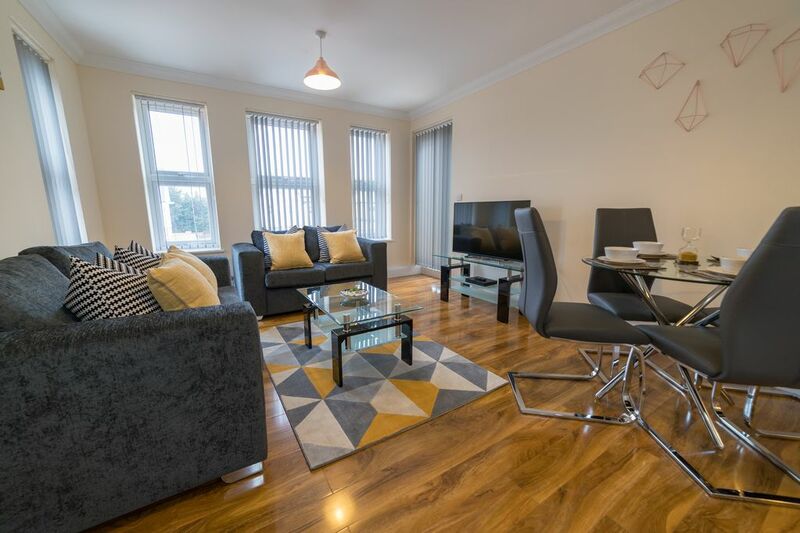 This apartment is situated in a brand new development which is set off the main road to minimise noise. A master bedroom complete with en suite bathroom, separate 2nd bedroom and master bathroom. A spacious living/dining space with open plan kitchen gives you everything you need for a relaxing stay. The living area comes with a smart 4K TV and Blu Ray Player. Complimentary wifi is available throughout the whole apartment. An allocated parking space is included. The master bedroom is complete with fitted wardrobes, a King size bed which can be split into 2 Single beds and an en suite bathroom with shower. Also included is a dresser/vanity desk to make sure you're looking your best. Our 2nd bedroom also has a King size bed which can be split into 2 Singles and fitted wardrobes. For your comfort both bedrooms have slot blinds and a black out roller blind, anti allergy pillows and duvets to ensure you get that perfect nights sleep. The kitchen is finished to a high spec and comes complete with the following:- Toaster, Kettle, Microwave, Cutlery, Glassware, Pots and Pans, Plates and Bowls etc. A gas hob and oven/grill are yours to use should you wish to cook. Need to wash some clothes? We have a washer/dryer along with iron and ironing board. Complimentary Tea, Coffee, Cereal and Milk Pots to start your morning off right. Body Wash, Shampoo, Handwash and Lotion along with luxurious towels are yours to use. Made a mess? Don't worry we have cleaning supplies with a Hoover, dustpan and brush and a mop. Our aim is to make your stay as easy and enjoyable as possible. Our home away from home will allow you to do this. We aim to meet and greet all of our arriving guests but should you have any questions and queries when we are not around full contact details are given.